Curtis Luck has defeated American Brad Dalke, 6&4, in the final of the US Amateur Championship being held at Oakland Hills Golf Club in Michigan. 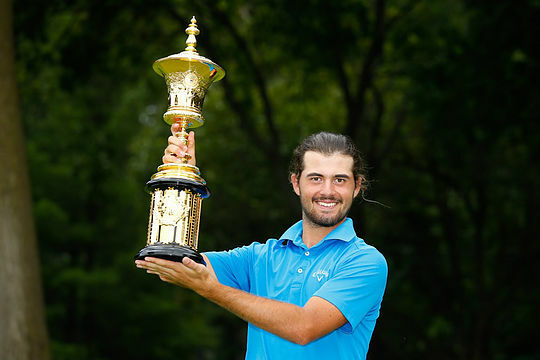 The 20-year-old Aussie was 1 down after 19 holes of the championship match but then hit his straps, winning the next eight holes to take a commanding 7-up lead to set up the victory. “While I was out there, he made a few errors, and of course the main thing is not to lose holes, but if he’s not in good position, that’s when you start thinking, ‘Okay, let’s win some holes’, said Luck following his win. Luck, who is a well experienced match play exponent having regularly played the format in Australian events, including the Australian Interstate series and the state amateur events, kept his composure knowing that any slight let up on his part could easily open the door for his opponent. “You know what, I think I handled myself really well today and at the WA Open, in fact, and I think that’s why I closed them out quite well having that experience,” said Luck. By winning his semifinal match against Nick Carlson on Saturday, Luck had already earned invites to the Masters and US Open. The victory on Sunday gets him a spot into next year’s Open Championship as well. Luck had planned to turn pro in a few weeks and go to qualifying school in Japan and in Europe but that is all now on hold following the win. Luck becomes the third Aussie to win the US Amateur with Walter Travis (1900, 1901, 1903) and Nick Flanagan (2003) former champions. Australians now hold both the US Junior, following Min Woo Lee’s win last month, and with Luck’s victory, the US Amateur in the same year.